At that time the term chip-tuning was completely unknown to us. Actually chip-tuning wasn´t very common yet and it didn’t fall into the area of our interest anyway. But a potential client contacted us with an idea for a project. It was a car racer from Germany. He was taking part in the Clio-cup rally. In this competition, all the racers were driving identical cars. No mechanical customizations were allowed. The only allowed modification of the car was tuning of the engine by customization of the program of the on-board computer – basically it meant that one could, in accordance with the rules, change the contents of the ROM memory, in which the so called look-up tables of the control data were located. Those data are influencing the engine operation and power according to the actual RPM, position of the throttle valve, temperature, etc. In other words, changing data in this table has the same effect as adjusting the carburetor with a screwdriver. The big question was - how to do this? It surely isn´t possible to turn off the engine after each set-up, change the memory, turn the engine back on and evaluate the effect – such a tuning cycle would most probably lead to a never-ending story. We agreed on the fact that the content of every particular memory cell has to be changeable individually during the engine operation. Devices called memory emulators were available on the market, but they only allowed the user to change the content of the memory as a whole and the process would take several seconds. That would naturally lead to the failure of the on-board computer and the process would not be continuous. The only solution was to design a memory emulator specifically for this purpose. 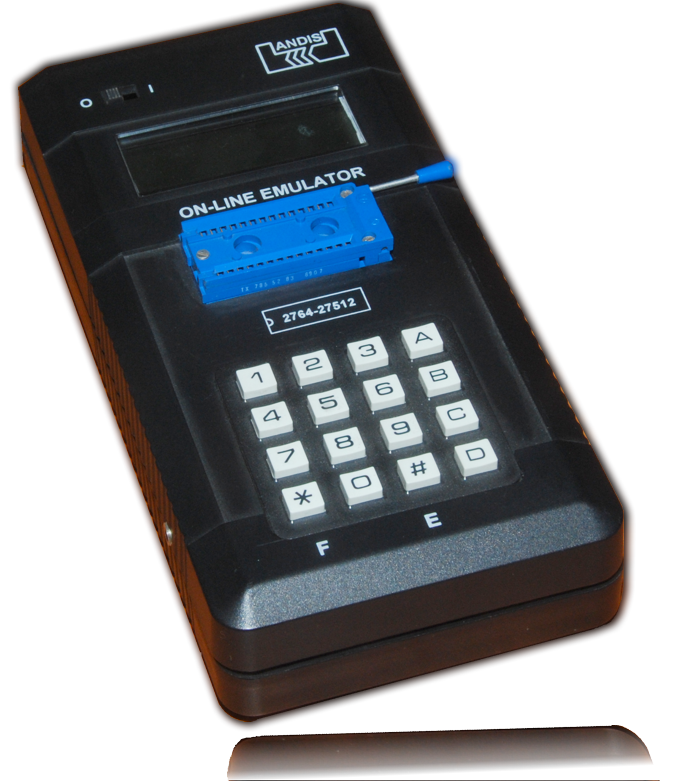 So we designed such a device and called it the on-line emulator. It did the following: the memory in the engine control unit was replaced by our emulator. Using a keyboard and a display, the content of individual memory cells could be selected and displayed. Then the content of any particular cell could be modified using the cursor keys as the driver saw fit. The data modification was so quick that the processor „hasn´t even noticed“ the process of the change. Hasn´t even noticed means that our emulator needed around one hundredth of a microsecond to perform this modification (light would only travel three meters in such a short time). The actual tuning of the engine was performed in a standard way in a garage - the car was hooked up to a special device called dynamometer, standing on cylinders rolling beneath the car wheels, thus allowing the engine and transmission to work while the car was stationary. The measurement instruments of the dynamometer were displaying the monitored parameters, such as RPM, power, engine temperature, etc. Using the on-line emulator the parameters of the engine were adjusted to achieve maximum performance just like by turning a screwdriver – conveniently and with immediate response.